PURI, INDIA: Ratha Yatra is the annual car festival of Lord Jagannath, the most revered deity of the Odias for the purpose of Jagannath's annual visit to Gundicha Temple via Mausia Maa Temple near Balagandi Chaka Puri. As per the history of Rath Yatra, Jagannath, his elder brother Balabhadra, and younger sister Subhadra are taken out in a procession to Gundicha Temple and make them stay for the coming nine days, accompanied by Sudarshana Chakra. After which, the Ratha Yatra returns back to the main temple and this journey of Puri Jagannath Ratha Yatra is also called Bahuda Jatra. The process of Ratha Yatra seems different with the wooden idols of 3 deities, every year are taken from the Jagannath temple to the Gundicha temple. The 3 idols are placed in decorative chariots, these wooden idols are held all around the yatra, bathed with 109 buckets of water. After which, the idols are placed till the day of the procession. This festival is performed by the Royal Successor of Orissa. 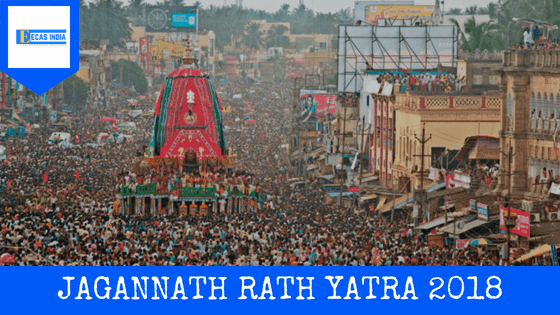 While there are many religious and spiritual reasons for celebrating Rath Yatra in Puri, the most important reason appears to be its occurrence during the onset of rainy season. It coincides with the start of agricultural operations prior to Rath Yatra, the deities take their annual Bath in a ceremony, fifteen days before Snan Yatra Day. It signifies the forthcoming rainy season, for which the Rath Yatra is a holy beginning for the people whose occupation relies totally on the agriculture. Another reason of Rath Yatra may be that Jagannath is God of all irrespective of caste, creed, and religion. As the temple is not accessible to all through out the year the deities come out and become ' PATITA PABAN', which implies "He comes out to save the downtrodden". The Emperor serves the deity indicating the latter's representative capacity where the Lord is the Supreme. Most of the rituals reflect the rich cultural life prevalent in the Indian state of Odisha. The brotherly love, family bonding and Odia foods dominate this festival period of Ratha Yatra, reflecting a composite culture of Odisha bordering on peaceful coexistence.